Thomas Graham, Professor of Chemistry at Anderson's University in Glasgow, coined the term dialysis in 1861. He noticed that crystalloids were able to diffuse through vegetable parchment coated with albumin (which acted as a semi-permeable membrane). He called this "dialysis". Using this method he was able to extract urea from urine (Maher JF, 1989). In 1913, Abel, Rowntree, Turner and colleague constructed the first artificial kidney. They used hirudin, produced from leeches obtained from Parisian barbers, as an anticoagulant. They passed animal blood from an arterial cannula through celloidin tubes that were contained in a glass "jacket". The glass jacket was filled with saline or artificial serum. They coined the term "artificial kidney". Blood was returned into the vein of the animal via another cannula (Maher MF, 1989). The inventors wrote: "this apparatus might be applied to human beings suffering from certain toxic states, especially if due to kidney damage, in the hope of tiding a patient over a dangerous chemical emergency." The apparatus was never used to treat a patient (Robson JS, 1978). George Haas from Germany performed the first successful human dialysis in autumn 1924. The dialysis was performed on a patient with terminal uraemia "because this was a condition against which the doctor stands otherwise powerless" (Maher MF, 1989). The dialysis lasted for 15 minutes, and no complications occurred. 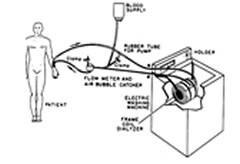 The first practical human haemodialysis machine was developed by WJ Kolff and H Berk from the Netherlands in 1943. 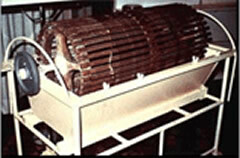 This rotating drum artificial kidney consisted of 30-40 metres of cellophane tubing in a stationary 100-litre tank. It was Kolff who made clinicians and experimentalists interested in the treatment of uraemia, and this machine that delivered the effective haemodialysis treatments (Maher MF, 1989). In 1946 Nils Alwall produced the first dialyser with controllable ultra-filtration. It consisted of 10-11 metres of cellophane tubing wrapped around a stationary, vertical drum made of a metal screen (Maher MF, 1989) - resembling a rotating drum device stood on its end. The original Kolff rotating drum kidney was modified in Boston to make the Kolff-Brigham kidney. In this form it was successfully used to treat renal failure in a few centres in the early 1950s, and in the Korean war. In 1956 Kolff and Watschinger developed the principles of the Alwall machine to develop the "twin coil" artificial kidney (illustrated left), a modification of the "pressure cooker" dialyser developed by Inouye and Engelberg in 1952 (Maher MF, 1989). Kolff gave away several rotating drum artificial kidneys after the Second World War, so that other clinicians can become familiar with dialysis. The Royal Postgraduate Medical School at Hammersmith Hospital, London was among one of those who received an artificial kidney. It was promptly used, but with limited success (Maher MF, 1989). Bywaters and Joekes published a report on 12 patients treated with the artificial kidney at Hammersmith in 1948. Despite their apparently favourable experience as described in their paper, the machine fell out of favour and use, and for a decade the weight of opinion in Britain was that dialysis was laborious, dangerous, and produced no better results than could be achieved by careful control of fluid balance and protein and calorie intake, as promoted in the the UK by Bull. In Leeds, Dr Frank Parsons had to explain to his professor of Medicine and the Board of Governors of the Leeds General Infirmary that he believed in the value of the artificial kidney, when they had already been told that there was no place in British medicine for artificial kidneys. Parsons had spent 3 months with Dr John Merrill in Boston, one of the pioneers of both dialysis and transplantation, learning about the Kolff-Brigham rotating drum dialyser. He convinced his colleagues to buy a Kolff-Brigham rotating drum dialyser for Leeds. He was left with the remarks, "Parsons, try it, but remember that the country is against you." (Parsons FM, 1989) A Kolff-Brigham machine was installed in the Leeds renal unit with the support of the British Medical Research Council. For details of the three units operating in the UK in 1958, see the report by Robson and Dudley from the Royal Infirmary of Edinburgh, 1958. Go to dialysis for acute renal failure in Edinburgh. The first patients treated by dialysis were all believed to have acute renal failure. The methods in use for getting adequate flows of blood into the machine exhausted veins and arteries very quickly, and only a few dialysis treatments could be undertaken. The development of methods to use blood vessels repeatedly while preserving them made it possible to contemplate keeping a few patients alive for longer periods even though they had permanent renal failure. Home haemodialysis was introduced to overcome the difficulties in providing adequate facilities in hospitals for the increasing number of patients being put forward for treatment. If a relative provided help for the patient, it could be carried out without the use of doctors, nurses or hospital premises, extending the number of patients that could be treated, as well as being better for the patient. However in 1965 at the American Society of Artificial Internal Organs meeting, reports of home haemodialysis of four patients in Boston (Hampers et al) and two in Seattle (Curtis et al) were supplemented by a report of two patients treated at home in London (Shaldon). All reported success and plans to expand their programmes. In the UK outbreaks of hepatitis accelerated home haemodialysis programmes, as it became a priority to reduce the risk of cross-infection. Also at the ASAIO meeting in 1965, Nose (supported by Kolff) reported the use of domestic washing machines to stir the dialysate, initially in hospitals in Japan. Surely one of the most homely of early accounts, but there are conflicting accounts of whether this amounted to 'home' haemodialysis in Japan in the early 1960s. At the same time, a few patients with chronic renal failure were managed for quite prolonged periods by peritoneal dialysis - but this required repeated punctures of the abdomen each time treatment was given - usually once a week, each time for a prolonged treatment. This was possible because of improved techniques for puncturing the abdomen and maintaining the sterility of the dialysis solutions. The technique was also used for acute renal failure, though in most units peritoneal dialysis is now rarely used for this purpose. At the same 1965 meeting at which home haemodialysis was first discussed (above), Tenckhoff described a patient treated for one year by home peritoneal dialysis using the repeated puncture technique. 20-22h (60l) of dialysis were carried out once or twice weekly after a visit by a physician to insert the catheter under local anaesthetic. At that time, all attempts to leave an indwelling catheter became complicated by infection. Tenckhoff and colleagues later developed a soft tunnelled catheter that could be left in place, making peritoneal dialysis a viable treatment. There has been a long history of the dream of replacing defective organs with healthy ones (Craps L,1993). In 1933, the first recorded human cadaveric transplant took place in Russia. The first human kidney transplant from an allograft took place in 1936, by U Voronoy (Starzl TE, 1990). In 1954, the first successful kidney transplant between identical twins was performed by the surgeons Joseph E. Murray and J.Hartwell Harrison in collaboration with the nephrologist J.P. Merrill in the Peter Bent Brigham Hospital in Boston, USA (Starzl TE, 1990). The first kidney transplant in the UK was performed in Edinburgh by Sir Michael Woodruff and his team on 30th October, 1960, between identical twins. The first successful kidney transplant using an organ taken from a cadaver was in 1962 (Haeger K, 1989), made possible by the development of the first effective drug to prevent rejection, azathioprine. When due to kidney failure function is decreased considerably (less than 10%) then only treatment to save life is dialysis as generally immediate facilities for transplant are not available in permanent kidney failure patients.Therefore either Hemodialysis (blood dialysis) or Peritoneal(abdominal) Dialysis is performed. Delay may prove fatal. 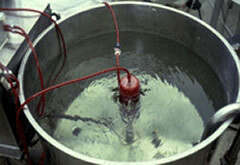 In one Hemodialysis session of 4-hours 120 litres of Salts solution (Dialysate-mixture of water and Hemodialysis concentrate) passes against blood intervened by a membrane. This solution purifies the blood taking away unwanted material and giving the blood required electrolyte and glucose. Therefore the quality of water through water treated plant (RO) should be excellent according to well-defined international standards (BP/EP/AAMI). If Hemodialysis Concentrate is of good quality but quality of water from RO plant in Dialysis centre is poor, it will cause toxicity or low-grade poisoning leading to long-term adverse effects and some sometimes severe consequences for all the patients. Hence RO water plant should be strictly maintained to provide the highest required quality of water.